Firestone was founded by Harvey Firestone in the 1890’s has been leading in the performance of rubber tires since then. The Firestone Tire Company was founded on a determination to offer the quality and service it takes to win the race, wherever that race may be. It’s how the non-skid tread pattern an industry standard. If you have a problem with Firestone you can contact their customer serivce center by calling toll-free 1-844-658-0724. If you would like to reach the corporate headquarters you can direct comments of feedback to Bridgestone America's Inc., 535 Marriott Drive P.O. Box 140990 Nashville, TN 37214-0990. Common issues with Firestone include All-Season Tires, Summer Tires, Winter Tires, Truck Tires, SUV Tires, Passenger and Minivan Tires and Crossover Tires. The company also offers various Tire warranties like Gold Pledge Limited Warranty, Buy and Try 30-Dau Guarantee, Supplemental Mileage Limited Warranty. Major tire products of Firestone are Champion, Destination, Fire Hawk, Trans Force, Winter Force, Affinity and Precision. Went to your facility on Paxton Street Harrisburg PA. Had a coupon for Ac performance check. Was told system was empty fill with dye recommended. Refill completed. The frustration was that the performance check cost was not applied to the fill. If I told them I needed. Charge I should have only been charged for the fill. My name is Ms. Butler an I have been given Mia permission to assist in the handling of this situation. The matter started back on March 25, 2019 when Mia took her 2015 Chrysler 200 which had about 62,000 miles on it into the above mentioned Firestore Care Center in for a simple oil change. She left the shop the same evening to get about a few blocks down the road before her vehicle started knocking an smoking. It was to late to take the car right back, therefore; the next morning on March 26, 2019 Mia began attempting to reach Firestone, but; was now given the run around. Mia than took the vehicle back to the location an was eventually told by the store manager name Emanuel that there was no oil in her tank when her vehicle was returned to her an that they would need to hold the vehicle to correct the problem. It was stated that in error “a new gasket was put over an old gasket”! The vehicle was left as requested, after a few days went by with no correspondence made Mia tired calling a few times an a woman each time would advise her to hold “only to hang up on her, this happened about 4 different times”. Please also be aware that my granddaughter was also given a rental from Enterprise Rent A Car which Emanuel set up “on March 26th located on Highway 85 at Firestone’s expense. Mia also gave your corporate office “reach# 675-937-7021” an was given case# 2356196-C by a representative name Cassandra who after making a call to Firestone, she stated that someone would be in touch with Mia within 72 hrs “this to date has never happened”. about the situation an status up to this point with her vehicle. She spoke with Tiffany Durham with Nationwide “an insurance adjuster” an was given claim# 782468-GI To my understanding, Miss Durham did go out to Firestone an saw the vehicle yet was only able right now to advise my granddaughter of the same information she had already been given. It was stated that still nothing has been done to correct Firestone’s mistake an that she was given No additional information at this point, please note that Mia also spoke with Miss Durham again on April 11, 2019 who still had not been able to get any true update on Mia’s vehicle. Next on Thursday April 11, 2019 my granddaughter received a call from one of the representatives with Enterprise Rent A Car who now stated that Mia now owes them $482.09 for the rental due to the fact that Firestone only paid them for 1 day! When my granddaughter got back in touch with Emanuel, he stated the rental will be taken care of? This is when the situation was brought to my attention due to I have an attorney who can step in. In all fairness, we felt it would be best to first see if this situation can be corrected before pursuing any further if possible. I went on to explain that the recording was only for myself due to a lot of people are not honest at all. I stated my only concern is that my granddaughter receive her vehicle back in the good condition which it was when she came in for a simple oil change. I also went on to explain that quite along amount of time has gone by with no results “this is not acceptable”. I went on to state that no one what’s this to result into a legal matter nor does anyone have time for so much unnecessary nonsense. It was than explained by me that I was sending this letter in hopes that we can go ahead an get this situation resolved “this should have never happened an is truly taking to long to correct”. Emanuel stated that Mia would hear from him by noon on Monday the 15th however it is now 6:15pm on the 15th an I have heard no update. I am hoping to hear from someone shortly. Your assistance would be greatly appreciated, all we need is to get this whole situation resolved an made assured that Mia owes nothing, please respond to myself or either of my grandchildren at the following. Would’ve been a better review if the mechanic wasn’t revving the piss out of my car as if it was his own absolutely unacceptable and un professional. I am not sure if he is bad at driving a manual or if he just wanted to make some noise but I’m NOT happy about that. took 2004 dodge ram for brakes rotor alliangment cost 1,300.00 waited for truck all day mechanic drove around building said it was all set took it how 7:00 pm notice it would go to the right still would not drive straight!!!!!!!!!!!!!!!!!!!!!!!!!!!!!!!!!!!!!!!!!!!!!!!!!!!!!!!!!!!!!!!!!!!!! Bought a battery from firestone about 2 years ago. Called them a day prior to coming in regarding battery needing a charge.Employee tells me who i spoke with and that that employee didn't work today what does the employee who i spoke with have anything to do with my battery issues. The wait was extremely long . Employee needs training in Customer Service . Take battery out of car have to get back in line.My whole Sunday is wasted.Not a happy customer will never recommend Firestone. I bought tires and do business with clay. I applied for your credit card at your cleburne Tx store. When buying some tires so I could get some other expensive work done. I forgot I had temporarily locked my credit file as I have great credit and keep eye on it. cfna called the store and told Chris I had my credit locked while I was standing there. He told them I was right there. He then hung up and told me I was declined because they can’t see my credit? I immediately unlocked it and Asked him to tell them it’s unlocked and he said would have to run another ck on my credit. I’m in finance and that’s the reason cfna called so I could unlock. Chris said no way to call them back to let them know unlocked credit. So I now have a credit hit, no credit card and that is wrong. I have close to a 800 credit score and because Chris is aparantly not trained how to take a credit app. He even told me to put at least 200 for household expenses when my pmt is 1600.00. Clay is great but Chris has no business dealing with customer problems because can’t is not ever a option with a customer!!!!! Disappointed Firestone not sure I will be back! Try taking a can help attitude instead of no can’t help!!! And I don’t know how! This affects my credit and I’m not done with seeking a correction? Been your biggest fan firestone but now see why reviews are 1 out of 5 good. Fix this maybe start here! 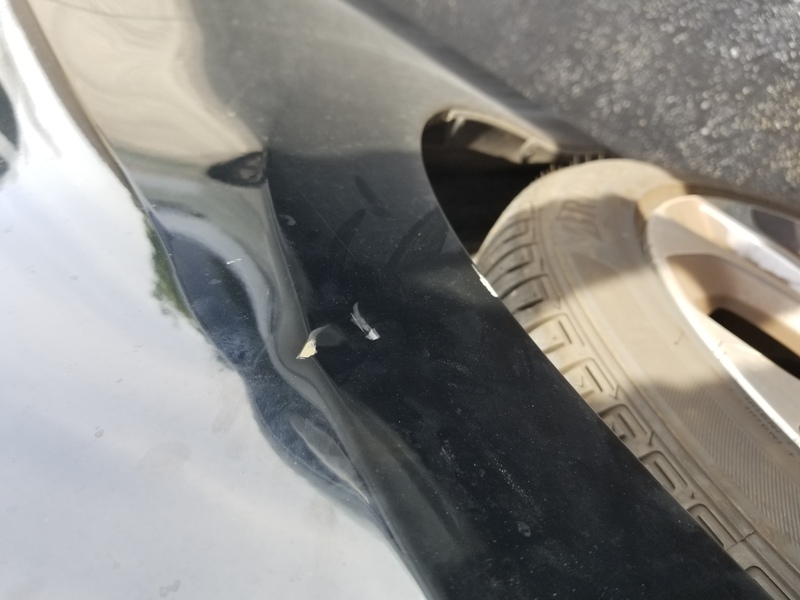 Today my son was at the Firestone Complete Auto Care located at 15697 SW 88th St Miami, FL 33196 for a vibration check on the front wheels, when picking up the car we realized that he had a blow on the front left fender, precisely in the side where he was working, a blow he did not have when he left there. We met with the general manager and with the technician Rogel (31), who with much discourtesy, wanted to pass us off as fools, denying our claim. I am a customer of you approximately two years, our four cars are taken to their workshops but today I left very disappointed in the bad treatment and discourtesy for a client. I tell them that I will not visit their facilities anymore, that all those who ask me for references will give the worst opinion and that I will stop using their credit card. Another element that I find counterproductive is that they do not have security cameras in all the business. Today I understood that this installation of Firestone is an unsafe business that has disappointed us a lot, not so much because of the magnitude of the blow but because of the dishonesty and little empathy with the client. I attach the order to provide more details and photos of the coup. Firestone tech overtightened the lugnuts on my car. Next time the tires were removed two studs broke off. Asheville NC Firestone manager Chris says I have to pay $150 for each stud repair. My college son spent over $750 to have an alternator and battery replaced at a Firestone on September 28th, 2018. Less than 4 months later (Jan 17, 2019) the alternator had to be replaced again. The alternator installed by Firestone was defective. My son broke down in another town and had to get it replaced right away to get back on the road. Firestone won't make good on the bad alternator because he didn't come back for them to replace it. After store manager said there was nothing he could do, I was put in contact with Area Manager. He said there was nothing they could do since they wouldn't be able to return the bad alternator to their supplier. But, I have the bad alternator to give them so they can return it to their supplier..."oh, well there is still nothing we can do". I then asked the area manager to provide me with the contact information of a higher level individual at Firestone so that I could escalate the issue and get a resolution. Well, as of April 3, 2019 I have yet to be contacted by a regional or divisional manager. The area manager simply says "it won't do any good to contact others because it will always come back to me". When I contacted Firestone customer service asking for higher level individuals with more authority, they respond by saying "regional mgr will contact you", then "divisional manager will contact you". Of course, none of them ever do. Their customer service department simply sends me an email saying "sorry, that's not typical, please wait 72 hours and someone will contact you". My son needs to be reimbursed the $438 dollars he had to spend to fix the bad work that Firestone did. Since Firestone won't do the right thing, I filed a complaint with the BBB and the Firestone response to the complaint was an offer for a free oil change coupon. Why does the Firestone customer service keep telling me they have escalated my issue and I will be contacted by a "regional manager" or a "divisional manager"? No one ever contacts me. I am very disappointed in the response from Firestone and the fact that they won't make good on a bad repair work. Since I was unable to get any response from a management level individual from Firestone I decided to try and reach out through the Firestone Facebook page, they seem to respond to comments but I've come to realize those responses are simply "bots" and not real people. I see too many others on that page that have experienced the same thing I have, they get promised a contact from Firestone but know one ever actually contacts them to resolve their issue. The really sad part is that now Firestone has deleted all my posts and blocked me from posting additional comments on their Facebook page. All of this to try and get Firestone to do the right thing. It's sad. Once a great company that was trusted for auto repair now rips off college students. It is obvious that Firestone will not stand behind its work. I guess they win. I hope you are happy you were able to rip off $438 from a customer. Hopefully, I will be able to educate enough other people on the Firestone business practices so others are not taken. Luckily, there are enough other auto service options. Good job Firestone, you should be very proud. The North Olmsted Firestone in Ohio 44070 are liars they said ,I had two holes in my tire could not plug because they where too close together. So they want me to buy 4 new tires. Took my car to Conrad only had 1 hole in the tire and they plug my tire. I will calling the channel 8 news I-TEAM on you guys. I will have their written report as well as the parts that show the reason for deployment. I am requesting a claim be open for the purpose of recouping my expense. Vehicle is a 2007 Rav 4 Limited. Contact info: res. 978-345-5968 Firestone facility is John Fitch Hwy Fitchburg MA 01420. 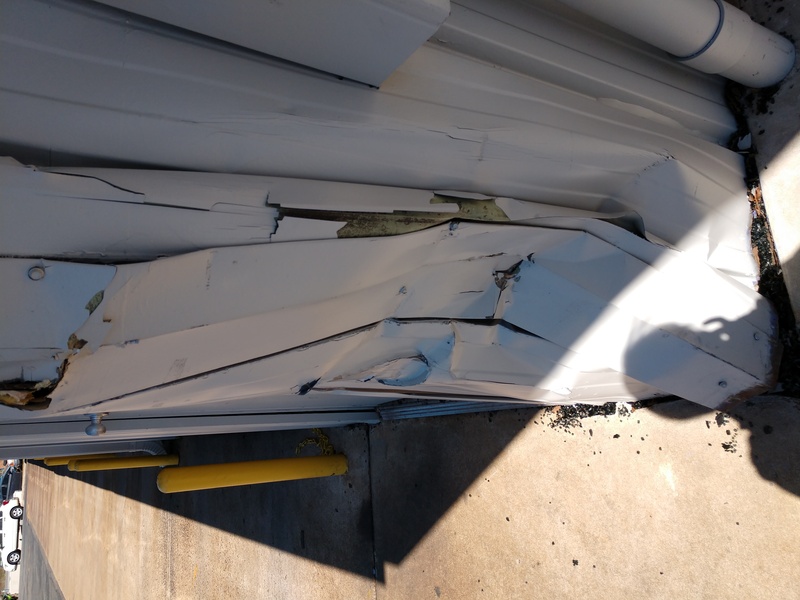 Attached is damage to the building from the collision. I have been a longtime customer with Firestone (711 Erie Blvd, Syracuse NY Store # 002755) over some 15 years, multiple cars. I had my Lexus diagnosed as as needing new tie rods for $1,648.48 the other day. The bolts/nuts were frozen. It seemed high so --Dave explained in detail waht needed to be done--removal of the entire steering system; very costly. i called another Firestone in Liverpool--they said it would cost under $600. I called a private shop and they said a similar cost. I went back to Dave the manager, and he said to do it right, i need to pay the higher amount. The private garage said over the phone, without seeing the car, that he never had a case of having frozen bolts and did not expect to have that be an issue--i brought the car to him and that was exactly the case. He freed up the nuts/bolts and did not have to replace the tie rods. I went back to Dave and he said that they must have referenced the wrong labor estimate (or the like) and these mistakes happen. I asked to speak to Alan the regional manager--he would get back to me. He never did. I called the Liverpool store to get Alan's number and left two messages for him to get back to me. Silence. If i could speak to his manager, that might light a fire somehow. I am exasperated that nobody will talk to me or explain the mistake. I am very concerned that i have over paid in the past--i recently had my struts replaced with the same car--was there a "mistake" with the labor costs? Have i been overcharged for other items? I would guess that i have paid over $10,000-$15,00 to Firestone--maybe much more, not really sure. i would be curious to know what i have spent for the cars that i have paid for over the years. So not happy with customer service to say the least. Trying to get a sense from you guys what is going on, before i let loose with a review online? ?--but really have zero confidence in who is running the shop now. Let me know if it is ever safe to go back there, which is convenient to my office. Took my car in for a oil change. Now it is leaking oil and they say it’s not there problem. Because it is a common part to fail on the penstar motor. Funny thing is I owned the car since it was new and never had a oil leak before the oil change. My name is Michael Monroy and my phone number is 904-608-6978 so you can review the notes on that day from the repairs. On Friday March 22nd I called Firestone and asked how much a new radiator would be because my car is overheating the past 2 days. The rep(short guy with glasses ) I didn't see a name tag ) said let's do a diagnosis to see if that's the problem and then we can go from there it costs 65$ which sounds like the smart choice to make sure that was the problem. Everything good so far they said it would take an hour and then call me with the results. When he called me back at 1pm he said we have good news and bad news good news the issue is a new exhaust manifold and we need to replace some gaskets the parts are cheap but it's labor extensive. I asked OK how much are we looking at ? He said it will be 700$ out the door. I asked how much are the parts he said about 140+ a few gaskets which are 10 or 15 each. I asked how long until the car would be ready and he replied we can have it ready for you by 2pm or 2:30pm. I asked why labor charges on something like this would be about 500$ per hour when the average is 110-130 per hour and that I don't want him to do anything I will call another place for a quote because that is way to high. He responded with ok I can take off the 65$ diagnosis fee so I went back up there for my car and let him know I will not be using Firestone anymore. I always get my oil done here every 2 months and I have purchased sets of new tires here but after this guy tried to take advantage of me I will not be returning to Firestone again on principal . What makes things worse is I went down the road to pepboys they looked at it and said your car doesn't need this it's just a gasket in the middle of the engine which is leaking to the back side of the engine they showed me the leak , fixed my car , and then they charged me $165 total. I would not have minded paying a little extra at Firestone because it's an easier location for me but because that guy (short guy with glasses) saw my Camaro and assumed I would pay any price on repairs said such a ridiculous amount now I will take my business to another company. Hi....Before I start, want to say that the Customer Service is always the best...so no complaints against the service up front and how I'm treated when I bring my SUV in for any service. My issue started couple years back...I first purchased a front drivers side tire because my tire had a nail in it and not salvageable.I had also had the passenger side plugged because slow leak. After few months, I ended up bringing truck back and getting new passenger tire.... After picking up my 2008 Mercedes ML350 SUV, My light that states I need air was still on from first visit.... I had gone in a numerous times, a couple different Firestone locations (should have a record of this) and each time, told that they put air in and it's off....As soon as I drive away and put a few miles, light comes back on. Needless to say, I kind of gave up on Firestone. My vehicle has never felt right since I purchased those two front tires....I had a few bad experiences this winter....no traction, almost went into a deep ditch, etc.....My vehicle just has never felt the same since I bought the two front tires. I brought my truck into Latham, NY Firestone and was told I needed two back tires, which I just purchased less than a month ago. During this visit, I had again, I had told the guy that the light on my dash board states I need air and I would like it taken off once and for all so that I would know when the heck I need air in my tires. They know I brought this in a few times for this issue. Again, I picked up the vehicle, light was off and as soon as I drove away, miles down the road, it turned back on. I again went back to garage on a Sunday and they checked all tire pressure and said all was good. How would I know this if my light is constantly on? I was told they could not fix it and I need to bring to Mercedes, which will cost a lot....Now why should I have to go to Mercedes and pay for something that Firestone did when they first put my first tire on? All should be on record. I have all my receipts stating I had this issue and they were checking it. If I take my vehicle to Mercedes because Firestone can not get it turned off, Is your company going to pay for it? I've spent thousands at Firestone last few years. I don't feel I should have to go pay Merecedes to remove a dash board light reading I need air in my tires when I had Firestone put new tires on for me and created the issue to begin with. Again...this complain is not against the managers or front desk...they have been more than respectful.....I just feel it's unfair and would like to know what you will do about it....I can be reached at 518-495-1193. thank you! Please be advised that 631south state Rd 7 plantation FL 33317 is not Firestone Auto care.. they are fraud using Firestone name, my complaint is that they using the Firestone name to lure customers in and let them think that they are Firestone... Firestone is a good responsible clean company the treats theirs customers with respect and honesty their name stands for themselves. (Firestone)!!!!!! was told to come in today to fix ball joint then drove there to be told may not get to it today!!!!!!!!!!!!!!!!!!!!!!! no record on last time it was there said they voided it feb. 28th when it was last there and I was told need ball joint/ why would you void service records gives the message you dont care to customer . Then let me drive there for nothing could of told me on the phone it would be better the next day. They should keep all records of someones vehicle!!!!!! I went to the Firestone on Lee Street in Des Plaines IL. For a radiator leak, they said they tested it and needed a new one plus hoses costing $1,400.00 in repairs. Not only did they not get the diagnosis right... the first time it continued to leak the clamps were loose, the second time they said it was fine, after the third time going back now they are saying it is the water pump!! They broke both mounting brackets the overflow tank was loose and the did not put the clips for the grille back, and it’s still leaking! I’m going to call corporate this week for a resolution...I need answers for why I have to go through this mess, this truck is for my daughter and granddaughter to get around but now the truck sits and so does my family. March 2, 2019 Appt. @ 0800 AM for oil change.Took technician if you can call him that over 2 hours, He walked around asking other tech. for help and tools.Watched him put a ratchet wrench on drain plug and could not loosen it, he was turning it the wrong way, before I could get around the building to tell him, he put a breaker bar and socket on it and stripped the plug it took another tech. to finally remove the plug.I was told it was stripped before they worked on it. (I have the stripped plug) they put an over size plug in its place and continued working on my car. Now I have a over size plug that might not hold and a 3000 mile trip back to Michigan. I have a lot more to say about this service center and its not good. Took my car to Firestone in December 2018, they claimed car was fixed but it broke down again and had to take it back and was without a car for 2 days. Then, I took it to them this past week. Same thing. They said they cleaned battery corrosion off the top of the battery. But, I broke down again with my 2 kids in the car at night in the cold. We had to wait for a family member to come who had to clean off the battery himself as they clearly didn't do it. Never again will I go to Firestone in Hermitage, tn. Took van in for battery check. Battery would go dead.they checked battery.they worked on wireing harness. Now lights stay on all the time.they had the van for eight hours. The problem was solved when they replaced the battery.lights still stay on all the time. Also other wireing problems. I want to recolonize Diana Childress, Bob Conti and James Cundiff located at 2408 Chesapeake Square Road Chesapeake Va. 23321 for their knowledge, professionalism and expert costumer service my wife and I received when I went to your Firestone Complete Auto Care center. We had gone to NTB for services which included a front end alignment and when I got the car back it pulled to the right badly. I was told by NTB the vehicle needed additional parts and work. Our car is only a 2012 and I doubted what I was told. I went to Firestone and your team performed their front end alignment and our car handles like new. I was told that after an alignment the steering function also has to be adjusted sometimes. Thank you all and I plan on purchasing my tires for our 4 vehicles from this location. I went this morning for an oil change after driving 5 min a noise was coming under my car so o decided to go back there, they told me that they fix it, it was a piece of metal that was loose and i asked to see it, it was in the trash and i was told that it's not important so asked them if i can get that and ask Honda if it's not i just called Honda and they say everything in car has it's importance, and i am sad want that to be fix asap please. My is registered under the name of my son Jean Antoine Matadi, it was at 1191 Rockbridge rd Norcross, invoice 109750. Waiting to hear from you my # is 7206203087 thank you. On the day of the superbowl I took my care to the Indianapolis Keystone Av center and had my battery replaced. Same week on a Friday night it was around 18 degrees and I was at work, I went to start my car and it started right up so I moved my car and was going to take another spot after I turned the car off, this time I went to restart the car and lights went down and so did this brand new battery, I heard these ticking sounds, I went back to firestone that Saturday of the same week and the guy was trying to say my starter was bad and that was the problem, The same day I was at work I went to seek a jump from anybody so was gone about 10 to 15 min. and tried to start the car again and it did start, now if it was the starter it would now have started , also I had my car in the shop to get my 100,000 mile check up and there were no problems with my starter or they would have let me know this, I am sending this to be on file in case this happens again I will expect a battery replacement or my money returned to my credit card and will buy another battery some place else that I can count on to start, nor did I like the way the sales guy talked to me.. The Firestone Auto Service Stores in my area (Jacksonville at the Marine Carp Station Jacksonville NC, and Cape Carteret NC) are not complying with the Firestone Gold Pledge Supplemental Mileage Limited Warranty under the Free Replacement Period of 3 and 4 year covered under the Gold Pledge for the covered tires for excessive tread ware. Even when we show the proper paperwork proving the tires have been properly maintained by licensed auto repair dealers. They are constantly trying to prorate the tires outside of the Free Replacement Period. Main reason is that they don't get reimbursed for the tires and are out the expense of the new tires, reasons given they send the tires in for replacements and the shipment is lost or not recorded at the receiving end. The biggest reason is that they were "Trained that the Gold Pledge covers only [defective tires only] bypassing the first part of the Gold Pledge Supplemental Mileage Limited Warranty. I've have used Firestone since Firestone revamped their image since they fixed the issues of the defected tires blowouts of the 1990's. I've had not problems at Firestone Auto Stores in Georgia, California and Florida, is it such a problem in North Carolina? My car is now sitting at the Firestone on Jacksonville MCS Jacksonville NC waiting for me to contact your Customer Reginal Center. Please can you correct this issue or if I've been wrong all these years and the other Stores were as well? I respectfully await you replay. I dropped my far off last night for an appointment this am a 8am for an oil change and engine light for emissions problems. Was told I would get a call after it was looked at to tell me what was wrong and to give them the go ahead to fix it. I called them at 1030am since no call and of course oil change and diagnostic done. Had I not called I would still be waiting for a call. Now I have to wait until the end of business before my car is done. This Firestone has horrible customer service they never call their customers back on a timely manner. This is the 2nd time I have had to complain on them in less than a weeks time. I am requesting that Firestone honor my Life Time Warranty on Customer invoice 148302 and Invoice 188867. I have three certified mechanic that indicate that the strut and lower ball joints need replacement and Tie Rod. However, the local manager say they do not. If they drive the vehicle they can feel and hear the problems. With the added stress and frustration this has caused, I am requesting that labor charges be waved. If you need to contact me for further information or clarification on this situation, please call me 904 764 9792 or 904 502 7846. Bad service I call yesterday 1/12/2019 to see if my car was ready and they say yes your car is ready you can come and pick it up, when I get to firestone and get ready to pay, your car is not ready, it’s gonna take like an hour, what kind of service is that. Went to have an oil change done at Shorewood,Illinois location had an appointment for 7:30 on a Saturday morning.was told that two people called off and that it would be a little wait,ok no problem how long one and a half hours.ok I Will just come back,well we can't hold a spot I said what I have an appointment you told me your problem.and now you want me to wait for you because the time you have me might be taken.worst service ever,needless to say Merlin auto gets my business now. My van was stolen from firestone , and no one behind the desk knows where my van was nor my keys that was who dthe desk or where ever they store the keys !!! Made a police report and van was retrieved and was towed to my house , with no keys , and everything of my things gone , the middle seats gone , my stereo equipment gone , my radar gone , even the van battery gone , I have a stripped out van in my driveway that I can’t even move , whoever was working at the time when my van was dropped off needs to be questioned not the new employees that are there , this is totally uncalled for and I’m to the point of contacting a attorney and the news media ! Again I have to complain about my service with your company. Again, if it was not for the convenience of its location, many of the customers I’ve talked to, including myself, would go to another establishment. So realizing that I had purchased Struts at Firestone in the past August 15, 2013 and Tie Rod was done on 6/26/18, I went back to Firestone and showed them this list and they rechecked my car and indicated that they did not see anything wrong. So I took my vehicle to two other mechanic and they indicated that “Get struts and lower Ball joints for the front of the Saturn”. Now I go back to Firestone and is told that in order to replace the parts with a lifetime warranty, they had to have defected parts to return. Well, if mechanics are saying from different sources that these things on my car are needed, it would appear to me that the parts must be defected. So the manager told me to take my car to another Firestone or a TiresPlus and get another opinion. I will do that, I shouldn't have to, but if the next company’s mechanic says that these parts are needed repairs, Firestone should not only replace them per the warranty, but NO LABOR CHARGE should be incurred since it is on me the customer to continue to use my TIME, GAS, emotional anguish to prove that Firestone does not honor its warranties even after paying for them! I’m not asking for anything that I should not get or have not paid for, check the history of payments to Firestone for my L200 2003 Saturn under phone number 904 764 9792, Pauletta Tave. Please look at my vehicle histories, I have paid an extraordinary amount of money to Firestone in the past for supposedly needed services and I continue to have conflicts when a second or three opinions of recommended services is done. This is not my first complaint and I hate having to take time making a complaint, I just want, in this case again, paid for services in the past with warranties honored. I have been coming to this store since it opened. At first the service was excellent, as most companies, as your customers base grew, your service declined. I came back today because of problem with my rear brakes. I choose Firestone because the brakes were done before here, and I would get " free " pads. But like in life nothing is really free. Diagnose a caliper that stuck, BUT, I would need pads, caliper and disks. All for the low price of $939, but he could take $100 off. So I would pay $839. So as I was stewing in your small uncomfortable waiting room, I called Honda for their price, to my surprise, using OEM parts it was only $82 more. The outcome never again, the last visit. I know though one sucker gone, and a hundred waiting, so no big deal to you. I am writing this for me, not thinking I will get anything from you but canned corporate platitudes. "....A Fish Rots From the Head Down (A Note to the Sales Leader) ... The statement “a fish rots from the head down” means that leadership is the root cause of an organizations failure and demise. This is true whether that organization is a country, a company, or a sales force...."
I have been a customer of your company for many years and went a local store in Ocoee, Florida had an issue with an tire on my wife's auto and the store manager said since that tire was over seven years old they would not attempt to check the tire which had what appeared to be a nail in the tread of the tire. They would only sell me a new tire. When I asked the technician which did the work his statement was the nail was in the side wall of the tire and could not be fixed. Please explain is this Corporate policy to only service tires that are three years and under of age and sell a new tire if the tire is older than three years. The so called manager was talking down to my husband. And when I stepped in and told him that were is the professional conduct or just plan customer service and why would he feel the need to talk to someone in that manner and that is bad for business he no longer wanted our business and wouldn't give me is name and when I asked for the manager that's when he stated he was the manager and I told him he needs to to know the difference in customer service and we are not begging we are paying so we will not be treated in this manner. I will never return to Fire stone and I will tell my family and friends about the awful service. The store is in Amherst NY on the corner of Sherdian. 525 Saw Mill Road, West Haven, Ct. 06516 on12/03/2018! I took my truck 2000 Ford Explorer to only get an oil change and tire rotation! I was asked at the front desk did I need anything else checked! I said No just that! Instead they decided to check my spark plugs replacement, Fuel System Cleaning, Coolant Fluid Exchange w/Standard Antifreeze, Alignment Service, Alignment Service (Lifetime Warranty, Belts, Braking System, Gaskets Engine which would cost 2,120.34, which I declined! I was called and told that my belt was about to break also my cable etc. I did not ask for anything but my oil change and tire rotation! My check engine light came on less than 30 minutes when I went to get my car and when I took the car I didn't have my engine light on and I didn't or don't accept the fact that it's still on NOW!. I called and they told me to bring the car back and I did and they got the light to go out only to come back only to come back on and is still on! I called this morning to let them know because I was told to bring it back and I wanted to know when and they let the phone ring a long time! Then they finally answered it only to ask me to hold on and I did and then they hung up! I called back and they claimed that they couldn't hear me and wanted me to call right back so I did and I let the phone ring and ring and ring and they NEVER picked up! Please tell me what in the HELL is going on in West Haven! You have that saying up on the wall talking about Honesty! Is This Acceptable to treat a Reliable Customer like this! I have spent a lot of money at Firestone between the four cars that I have brought there! My Engine light was Not On and I want it off! About a year ago, I had trouble with the engine light and I had to bring it back 4 times before it was finally fixed! I want my engine light fixed because if your people had done just what I asked them to do, It would Not Be On Now! I Will Be Looking To Hear From Someone in that store to fix what they broke or I will call Better Business Bureau and let them fix the problem! Thanking You In Advance for your Help! Mrs. Mary H Murphy! 22 Edward Street, West Haven, Ct. 06516. Cell#203-314-2183! E mailed a complaint a week ago as yet no reply, please advise. I had scheduled an oil change for Nov. 30 at 12:00 at the above service store. I have had oil changes there before and I have bought 4 new tires there this summer. I never had any complaints. I always believed them to be fair and honest. They did the oil change and they pulled my car out. I went to the counter to pay the bill and he told me it was $56.00. I was lost for words. I never paid that amt. I have a 2007 Chevy Malibu. He told me they used a synthetic oil because my car recommends this. They never used this before. I drive approximately 8000 miles a year. I am 79 years old. When I first came in they asked me if I wanted a Forestone credit card and get 1/2 off my oil change. They didn’t tell me it was going to be $56.00. I think this was a poor practice on this service station. They should have told me that they do recommend this type of oil and I should have had the option. I will never go there again. I will get my oil changes elsewhere. On 10/21/2018 our van was towed in for service. My husband told Firestone in Fort Walton it was the computer they said we need to check it. They changed the alternator, the belt, the battery and it still wouldn`t run. Then they said they thought it was the computer. m to just put it back together as he didn`t think they knew what they were talking about. They put it back together except the fan belt and battery he then said to put the computer in. our van came in on Oct. 21/2018 we got it back 11/05/18 and its still running great. My complaint is we paid 112,50 for labor for the alternator that we didn`t need. He made a big deal out of he didn`t charge us to take it out but he put in a part we didn`t need in the first place! The trail and error isn`t good practice. We could have had a neighbor do that. I think our labor should be returned on the alternator seeing we didn`t need it anyway. When you go in for service you want them to fix what`s broke and just guess work. What I took to be the manager ,was quite rude to me. I had ordered 4 new tires for my SUV and it took 90 minutes. The two men in the waiting room were both constantly on the phone and while I waited to speak to them,never acknowledged that I stood there.. When I finally asked where the bathroom was,he gave me a hateful look and said:" I'm on the phone." I will never go back there, I got the feeling he is a racist. Recently I had a standard brake service performed on my vehicle, while driving home I noticed a knocking noise from the drivers side front whenever I drove over uneven road or a bump. When I was able, I brought the vehicle back for a recheck and was told nothing was wrong with the brakes, but that I might want to have some front end parts replaced. 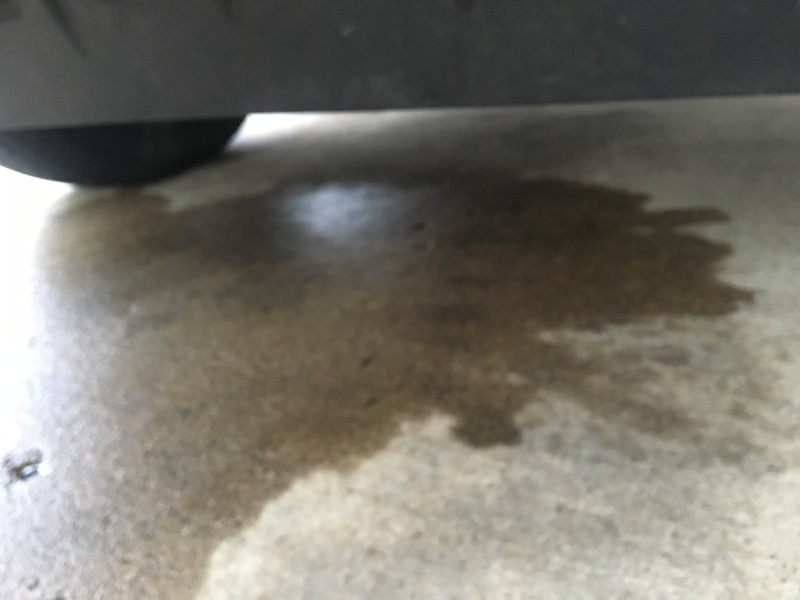 I found this questionable because the knocking was not present before, but immediately after the brake service, and so I scheduled it to be checked by Autoworx in Hendersonville. They found one of the caliper mounting bolts had not been tightened on the driver side front. I find it unacceptable that not only was this missed during the brake service, but on the recheck itself by the same mechanic at Firestone. I will be sending copies of all work orders and a photo I took of the loose and backed out caliper bolt taken at the local mechanics shop. Considering this issue involves one of the most critical safety components on a vehicle, I am frankly very angry that I was essentially allowed to drive around with a loose brake caliper, even after giving this shop the opportunity to correct the problem. A week ago I brought my car to the Firestone on Matthews Minthill Rd. In Matthews NC. I requested 2 new front tires and left my car there. I received a call a short time later indicating my two rear tires both had nails in them. I returned to the center with my husband who asked to see the tires with nails. One tire did have a nail in it the other tire did not. Needless to say he was upset and we did not have any tires put on there. I have done business over several years with that center and am disappointed that their integrity is no longer trustworthy. I will not be recommending Firestone to anyone again. My experience? Degrading is the word that comes to mind. I`ve been taking my Subarus to the Firestone Center in Hazleton, PA. for over twenty years now and it just saddened me to see how the personal "SERVICE" has all but disappeared the past 6 months or so. I made an appointment for an oi change, tire rotation, and alignment if necessary, but was told the alignment machine was out of order. No problem, it could be done another day. What did bother me was my bill; a charge of 79.30 for the oil change and no copy of the courtesy check that was supposedly done. I always felt good after having my car serviced up there, the technicians or service manager would go over the courtesy check sheet with me and let me know how the brake lining was, if the tires were wearing properly, if the filters needed changing. or any potential problem I should look out for. When my car was finished on Friday afternoon and went to ask about the vehicle I was told the amount of the bill. When I questioned the outrageous charge the female behind the register said I could get a discount by paying with a Firestone card. I told her I never had one and never paid such a price for an oil change and I was a gold card member which she just ignored. She finally said I could get a coupon online and she went to the billing machine and had my bill reduced to 60.13. The high price of the oil change didn`t bother me so much as the impersonal attitude and the lack of communication about my vehicle. Now for personal piece of mind, I have to take my vehicle to a mechanic friend to have it checked out for the winter and schedule another appointment for a wheel alignment check. I realize your company is in business to make a profit, but at the cost of the personal service that your long term customers were accustomed to and expected? It`s sad and I`m no longer looking forward to taking my business there again..
HAVING LIVED 2 BLOCKS FROM THIS STORE SINCE 1967,MY DAD & MYSELF HAVE BOUGHT MULTIPLE SETS OF TIRES & UTILIZED ALL THE OTHER SERVICES ON A CONTINUAL BASIS ,I HAVE TO SAY AS A RESULT OF LACK OF SERVICE WILLING TO PROVIDE BY MANAGER MEGAN MCCARTY,I WILL NO LONGER SEEK SERVICE FROM ANY FIRESTONE STORE OR PURCHASE FIRESTONE PRODUCTS.I RECENTLY PURCHASED 2 FIRESTONE INNER TUBES FOR MY RIDING LAWNMOWER FROM AMAZON. I TOOK THEM TO FIRESTONE ,AS THEY HAVE ALWAYS BEEN GREAT. HOWEVER,MEGAN EXPLAINED TO ME THAT THEY COULD NOT INSTALL INNER TUBES. I have been a good customer of the Firestone Store on Route 44 in Raynham,MA. for many years and usually have good service, until now. I brought my Wife's car in for tires a couple of weeks ago. I had 4 "Winterforce" tires put on at this location about 4 years ago and were very satisfied with how great the tires performed. That's why I decided to go back and have 4 new "Winterforce" tires installed. I called on a Monday morning to make an appointment. The person I spoke told me that they didn't have the tires in stock, but would have then by Thursday of that week, so, I said OK and told them I would drop the car off on Thursday morning. When I arrived, the person there said that the tires weren't there yet, but assured me they were on the way. I said that was OK but could you call when the car was ready and he said "No problem." Around 1:00PM, my Wife realized she needed a key that was on the ring that I left with the car. She went to the store to get the key and was told "Your car is done." My Wife then had to go all the way to my house (approximately 10 miles, one way), pick me up and go back. When we got there, the person at the desk said that during the "Courtesy Check" that the car needed struts and a fuel system service. I said that I would pass for now, and went outside. I told my Wife to drive my car and I would drive hers to make sure everything was OK.. When I went to get in the car, I noticed a bunch smeared grease by and on the door handle. When I got in, the area all around the ignition switch was also covered in grease. As I drove home, I noticed the tire pressure numbers were all over the place ranging from 23LBS to 38LBS. Not a big deal, as I have an air compressor at my home and I would check the tires there. When I got home, I walked around the front of the car and noticed the whole front edge of the hood was not only, again, covered in greasy fingerprints, but the hood wasn't even completely latched! So, I cleaned everything up, adjusted the air pressures to read the same and just wrote it off to a Technician having a bad day. That was until someone pointed out that two of the tires were mounted BACKWARDS! These tires are "Directional" tires and have to be mounted for a certain rotation-the two on the Passenger side were wrong. So, I went back to the Firestone store the next day and not wanting to make a "big deal" in front of a waiting room full of customers, I asked the Service person to come out to the car so I could tell him what was wrong. He said that there was no excuse for things like this and he would take the car in right away and fix the tires. The tires were fixed in about an hour and I left. For some reason, when I got home, Wanted to make sure everything was OK. It wasn't. The hubcaps that are installed on this car have plastic lugnuts that attach to the steel lugnuts that retain the wheel. The hubcaps on the Passenger side (the tires that needed remounting) were only held on by ONE LUGNUT ON EACH WHEEL! I retightened them but, rest assured, Firestone has seen it's last business from me. This is a follow up to a complaint that has gone unanswered regarding a rebate I was denied reason being the tires I purchased were sold at a prorated price. The original tires were 65,000mi wear tires that needed replacing at 42,000 miles. The prorated tires that replaced the originals cost $702, the rebate of $100 was for purchases of $500. These are entirely two seperated transactions, independant of the other. I had a life time alignment done on 6/18/14, since then I have been back a couple of times to have my car realigned. Both times I was put though the ringer just to get my car looked at. Today I went to try to get the car realigned and was told that my name was not in the system. Lucky for me I Keep records for 10 years or at least thats what I thought lucky me.The manager told me that he would go ahead an honor the life time alignment as if that was not what I had paid for in 2014. I went home and 20 mins later they called me to come and get my car. When I got there they told me they aligned the car and wrote notes that I declined the work for them to Checked out wipers,3rd brake light was not working, brake Fluid exchange, coolant fluid exchange w/ EXT life pre-mix coolant, complete Vehicle Inspection, Primewell Tire Package. They never asked me about any of those things. They did give me a print out of a bunch if items that they recommended, which none of them was a belt and what was really interesting is that the mechanic hand written notes stated that he did not test drive the vehicle because of a bad wiper and that the tag would expire next month as well as the windshield having a crack in it, which was not obstructing any vision. What was not looked at or noted was a damaged belt. When I got in the car and started to back out I noticed that the power steering was hard. I pulled back into the parking spot, popped the hood and notice that my belt was damaged. I took the belt in to the manager and asked him if the belt look like it had been cut but course he said NO and all they did was align the car. The belt had no cracks in it besides the slit from what I can see. I am writing you to make you aware that the Grandview MO store on Main street does not like to honor the life time alignment and by there actions does not care about staining the Firestone name. I have pictures if you need them. I hope you have some type of resolve for this issue. My wife and I have been getting services at your Fort Meade Maryland location. In 2016 I had a new set of tires placed on my wife 2007 Honda civic and was told the tire were of high quality. As of late there has been a loud noise coming for underneath, as well as, a rough ride. I took my car to the local Honda dealership to have it inspected and to my surprise the tires were the cause of the noise. Honda went on to say that it was due to feathering of the tires. 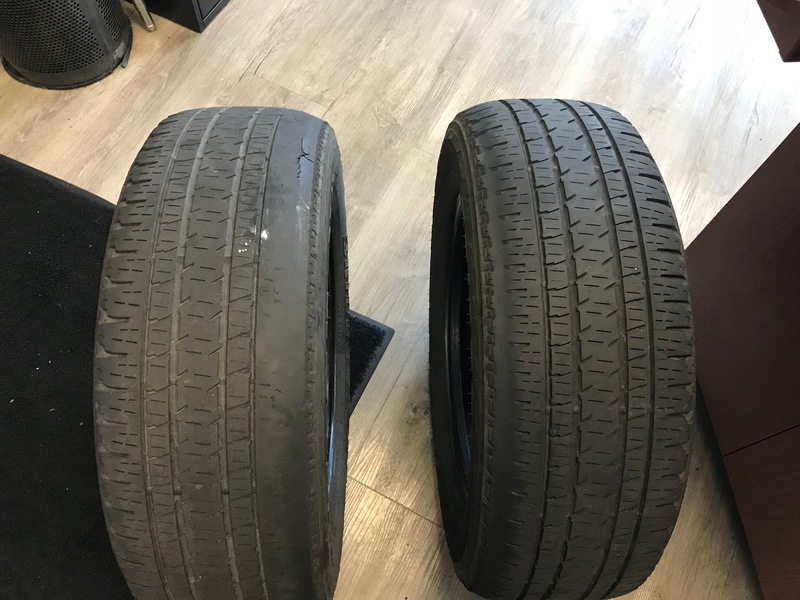 I did some research on the tires and found that the reviews were very poor,and that a number of other drivers have experienced the same thing with this particular tire. I called the fort Meade store to find out when the tires were purchased and was the warranty still in effect. I was told that I needed to be able to provide proof of rotation and alignment every 6 months dating back to the date of purchase. I want to know why your company continues to sale a subpar product and when a customer attempts to exercise their warranty, they are met with road blocks that make it difficult. Furthermore this year I took the same car to your fort Meade location for and air condition service and repair. At the end of the day I went to pick up my wife's( I never received a phone call to let me know that there was a problem)car and was told that it would not start. I was told that all the techs. had gone home for the day and that the would continue to work on it the following day. The following day I didn't receive a phone call with a status up date, so again I called to find out the status of my car only to be told that now it was completely immobilized and that it had to be towed to Honda for repairs. After a day at Honda I again had to call your store for and update only to be told to contact Honda. Honda informed me that the security system that was installed had fried the CUP and that was why the vehicle would not start. After the repairs were made and firestone pick up my car from Honda, and I went to pick it up from firestone. When I asked your tech about my security system that they cause to be damaged, I was told that the old system that had to be removed could be reinstalled. I was told by store rep the that the security system was something that Honda would advise against, but Honda not only recommend that the system be used they installed it. My firestone card was charged for the cost of the AC repairs they paid for the cost of the cpu replacement. My security system that was installed by Honda but told that Honda would not recommend was remove and not repaired or replaced. I was told that this was a common thing, if it is why have I been able to have my car repaired before and the LoJac has never caused this to happen before. I don't think that the base commander would be happy to know that veterans were being given such poor service and furthermore not being given truthful information and updates about their vehicle status. It makes me question weather your techs are qualified to do make these sometimes expensive repairs. This morning when to have an regular oil change and the manager wants to sale the expensive one because he said the car only runs with sintetic and that's a lie he tried to rip me off and that for me is steeling. I don’t think it’s customer friendly to have the customer be the delivery person between store locations that are quite a distance from each other (at least 15-20 miles each way). How is this putting the customer first if we are doing all the running around for a simple battery replacement. I understand there is a charge for disposal of hazardous materials (such as car batteries) but I don’t think I should be charged this amount considering more than $10 has been spent in driving back and forth across town. I had another bad experience with Firestone on August 16, 2018. Less than a year ago I purchased an Interstate battery from Firestone for my son’s 2001 Honda Civic. The car would not start basically doing what it did a few months ago. My son took the battery to O’Reilly Auto Parts and they told him he has a bad battery. We then drove to the Firestone store #19852 (located at 7950 E Speedway Blvd. Tucson, AZ) We waited about 2 hours only to have the repair guy at the store tell us they could not test the battery because the machine that they use was not working correctly. I explained to the Firestone Auto Repair Tech that the battery had been tested by O’Reilly Auto Parts and the reading came back bad battery and I was sure it was the battery because it was doing the something it did the first time I brought the car in. The Firestone technician said you will have to take the car to another Firestone location to get it checked out before I can give you another battery. He stated if it’s the battery we will replace it but charge you $30.00 to install the battery that they just installed 8 or 9 months ago. Please note the battery was just replaced by Firestone less than a year ago and you want to charge me $30 after I find another Firestone store to prove what I’m telling you regarding the battery. On August 17, 2018 after taking the day off and driving to another Firestone (#29629 Broadway and Alvernon) location I was told it’s a bad battery but there was not a replacement in stock. There was a battery available at the Speedway location and after picking up the battery my son was asked to leave a $10 deposit and take the bad battery back to the Broadway location (store #29629). I don’t think it’s customer friendly to have the customer be the delivery person between store locations that are quite a distance from each other (at least 15-20 miles each way). How is this putting the customer first if we are doing all the running around for a simple battery replacement. It’s quite concerning that he’s driving back and forth with the bad battery and we waited in the Speedway location for more than 2 hours so we couldn’t take care of this yesterday. I understand there is a charge for disposal of hazardous materials (such as car batteries) but I don’t think I should be charged this amount considering more than $10 has been spent in driving back and forth across town. Being 75 doesn't mean take advantage of me with 1 price for 4 new tires which I was trying to pay upfront and when I came to pick up my vehicle another 150.00 dollars added to my bill. Me Darian Harris did straighten out bill but I believe it was a scheme since Darian didn't accept full payment when I dropped off my car. I took my f250 into the Firestone near Pearland Parkway for a front end alignment. Two days and two attempts later it’s not aligned right. Two days later I am at the Firestone at 9530 Broadway St, Pearland, TX 77584. I arrived before opening and explained the situation to the counter personnel. Coldly, as if I were an inconvenience because I previously purchased the lifetime alignment, he told me it would be 3 hours. I have 4 Firestone tires on my truck I bought new. I find this to be unacceptable; if you warranty something and it can’t be fixed at one location it should hold some level of importance to hopefully keep a customer. My wife took my sons 2015 Altima for service today 07- 19-18 at center in Rowlett, Tx. She did not get the service she needed and was treated rudely and im not having it. We have spent tens of thousands of dollars at that facility and if you want a dime more we need satisfaction. Somebody needs to call Diane Walls at 972 841 6310. I keep several cars at a time always and can take my business elsewhere. I have been a customer for almost 9 years and utilize Firestone for all my auto needs. I went to the Fairview Heights, IL (Store #15288) on Sunday, July 15th and received poor customer service from the new manager, Carl. A cover under my vehicle was hanging, which only needed a screw, clamp, or temporary removal and he completely blew me off. He stated he wouldn't be able to get to me until Tuesday despite how minor of a situation this was. I could understand if I were asking for an oil change, a major repair, or new tires, but this was an issue that took all of 10 minutes for one of your competitors to resolve. A competitor was kind enough to remove the cover and wrap it up in plastic so that my vehicle would not be at risk of damaged over the next few days from this cover getting ripped by getting caught on something. Firestone was the company that ordered and installed the cover for me once before. However, this individual didn't even feel the need to make an attempt! I have NEVER experienced such rudeness and disregard as Carl displayed. When the prior manager or prior employee by the name of Mike was there, he always showed compassion for the customers and would never send a client on there way to a competitor. I am so disappointed this client experience that I have decided to either change Firestone locations, which is an inconvenience to me as I live in Fairview Heights or I just may need to find another auto service company. Someone needs to give him customer service lessons to work on his skills because he has none! The new management assignment to the Fairview Heights, IL store is disappointing! 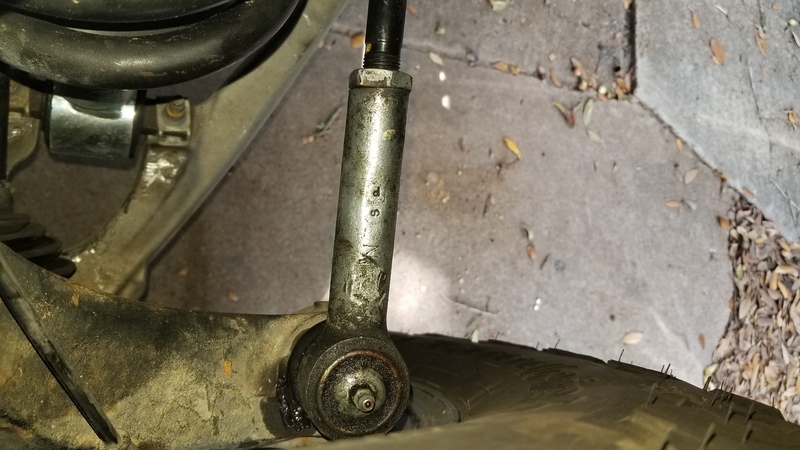 I had my vehicle towed to a Firestone in Homewood ILLINOIS on 6/12/2018 to have my rear control arm repaired. I entered the office area to speak with a customer service agent. I waited approximately 25 minutes for someone to come in and acknowledge that I was standing there waiting for service with no other customers in front of me. Someone from the repair area finally appeared, and with no greeting register my vehicle for services. The following morning Brandon Turner the store manager called me to inform me of the repairs I would need for my vehicle along with prices. Although I felt that the quoted prices for repairs was a bit excessive, I informed him to go ahead with the repairs. After talking with Brandon and taking time to really dissect the charges I decided to go up to the shop and get better clarity on repairs and pricing. When I got to the shop I spoke to Brandon Turner about the overall repairs and charges for my vehicle. Since I needed to have the rear control armed replace, Brandon also put a charge on my bill for an alignment. I asked him was that a recommended repair or mandatory repair. At that point Brandon became very irate, rude, and disrespectfully condescending toward me. He told me in a very aggressive and demeaning tone that I had to get the alignment. I ask him was it for safety reasons or just a matter of comfortability, vehicle handling, and to better preserve my tires. At that point he told me that he could not do the repairs on my vehicle unless I got the alignment. I would have been fine with his explanation, but immediately after giving me his explanation for the alignment Brandon stormed away from the customer services desk toward the repair area door while loudly in front of other customer threatening to take my vehicle off the lift if I wasn’t going to get the alignment done. At no point in our conversation that I stated that I was not going to have the repairs with alignment done. I simply was attempting to get clarity on the repairs for my vehicle. I have been a long time loyal customer of Firestone for years and have never been treated with this type of utter disrespect! First I would like to say is,what happened to management and the experienced mechanics at this Firestone (west 5th,Pine Bluff Arkansas),I'm sitting here with a group of male customers who all are complaining about this particular store.I scheduled my appointment for 7am for an oil change and tire rotation, didn't leave until 10:30am.When I arrived the(opening) technician,not a manager,he was nice,but his other technicians didn't arrive until after 8am! My complaint is that when I arrived to this Firestone,my truck was driving fine,after my oil change and tire rotation, I left to run an errand,and felt like something was different about my vehicle,after running my errand,when tried to put my vehicle in reverse,it shut off x3, when it finally started the 4th time,put in drive,it was making a rumbling sound under my hood! I've never had this problem! I was afraid to drive it to my next appointment (which I had to cancel),so I drove it to the nearest Exxon full service,called my fiance so very upset. I also called this Firestone back,and let the receptionist know I was having a problem with my vehicle, I just left there from getting an oil change and tire rotation ( she was nice(and sent the opening (technician).He stated to my fiance that"it's probably the motor mount" ect ect...When in all actuality he truly didn't know.He trailed me back to Firestone,put my truck on the machine,and claims the print out didn't find anything,it's out of his hands,he really doesn't know what's wrong.But my fiance checked my fluids before my appointment,when I gave him my printed receipt of services,it showed that the technician checked everything as if he checked them,but really didn't ! When my fiance asked the opening technician why would they check all of these and knowing it wasn't done, and how many other customers have y'all done this to, especially female customers,he had no answer! I really don't know where the manager was,but I do know that the service is definitely not the same,they have so many (young)new people, including the manager,and so many complaints. I haven't had any problems until now and I'm so very disappointed. I'm now having to take my vehicle to a Chevy dealership to see what's wrong with my vehicle because even though it was put on a machine, I was told by the opening technician,he really doesn't know what to tell me. I never got a print out from whenever it was put on the machine, I left there in tears,just disgusted.While waiting on someone to bring my truck out,there were three gentlemen waiting,and their conversations were all(negative) about this particular Firestone location.I sat there and listened on how many repeat visits they had to make because of repairs that they thought were fixed but had to keep bringing their vehicles back because it either wasn't done right the first time or they made the problem much worse..I'm sitting here listening to this in tears,like okay,it's not just me.I wanted to bring this complaint to your attention because it's truly not the same from when I came in the past. Ive purchased tires, gotten my oil changed,and tires rotated with no problem,and have noticed all of the older experienced technicians are no longer there,which is what the three make customers all stated. I have friends and family that I referred to this location because at that time it was truly wonderful service,but now they will no longer come here because of what happened to me today.The only positive thing I can say about the experience is that the female receptionist was nice and she was apologetic, and even though the"opening technician"was nice,he was not knowledgeable about what was going on with my vehicle. I felt like since they were already an hour behind,it was a rushed job,and something was done to my vehicle,but they would never admit it. I believe that when you trust someone to do the job right and you're spending your hard earned money,no one should be treated like this way.Enclosing,I would like to thank you for your time and I pray that you take out the time to fix the negative issues that are happening at this store. When we first got to the store, the person who's name I neglected to get was very rude. He acted like we were bothering him. He couldn't wait to get us out of the store, I understand that it was almost time for him to leave so I let it pass, and he left the store. This guy never asked us if we wanted to check anything else on the car. Even though I have a Firestone charge card I don't think I will be going back again. I can get rudeness anywhere else I go. After 2 1/2 hours I called to see if my car was ready and the person who answered was named Mikey. When we arrived to pick up my car, I asked him "Where is every body at?" because the place was empty. His answer was "Why? Do you have a lot of people with you?" It was obvious that there were only two of us. He never gaves us a smile or any kind of common greeting. He was even more rude than the guy who initially took care of us. Went by store 355332 on 7/5/18 around 10am, spoke to Mgr Nick about my 2005 Nissan Altima. He stated that he was unable to get it in and to bring it bac tomorrow. He took my name and phone # and set an appointment for me to bring it in on7/6/18 @8am. I checked in on 7/6/18 @7:34am and per work order will receive by 3pm. I requested a diagnostic and to check the catalytic converter. He was very knowledgable about the converter. Asked if he could keep it for most of the day.stated no problem. No communication all morning, expecting to hear about diagnosis. Called at 12pm, spoke with aTecnician that stated that the car has not been looked at and it probably will not be looked at today. Stated to him that the car was brought in early. He put the Mgr Nickon the phone. I asked why my car was not seen. He began telling me about a Tech calling off and having only 2 techs working. They were behind from yesterday. As stated that we handset an appointment and he had until 3pm. He stated that I could come and pick up my car and that they will not get to it. Stated it many time over. Requested Corporates #. He said that nothing would be done and I could come and pick up my car. Looked up Corprates # and spoke to Vivian C, very professional and helpful. Called another office down the road to get me in. When I arrived to pick up car, they had brought it in because Corporate had called. This should not have happened-communication is a key. Mgr Nick became very unprofessional in assisting his customer. If I sit in the office they get to your car. I have had a Firestone card forever and have paid it off continually. Very unhappy with that cusomer service. Hope to not need service again and will travel to the other office down the road. Eric at the other office very accommodating. In all aspects of Customer Service is Communicting effectively. Too old for unprofessional behavior! On July 5 I brought my car in to this location to obtain a diagnostic of why my check engine and other indicator. I was informed by the manager that the person who does their diagnostic was out on disability. When I inquired how long he'd been out ill, the reply was that it had been two months. When I inquired why someone else had not been put in place and expressed that this was no way to run a business. His reply was that he had spoken with corporate regarding the matter but since the person is out on disability they were unable to fill his position. This hold sitation left me trying to fi d a auto repair shop I could trust to assist me. Also I was told the only other Firestone repair business would be in San Bernardino, CA. which in my opinion was totally unexceptable. I am giving Firestone a minus 1 for extremely poor customer service. A few months ago we had a blower replaced. We picked up the car and all seemed fine. Two days later, heat blew only from the drivers side. We contacted Firestone and was advised that somehow a piece of plastic was broken and that the dash board would need removal and that was expensive work, another $1000. The charge for the first repair was over $900. We could not afford this. A short time later there was a loud noise coming from the car after the car was turned off. We recently had the car checked, not by Firestone and learned that there were there were several hoses and wires that were unconnected. This was discovered after the dash was removed. We believe we were done wrong by Firestone. We have been customers of Firestone for almost 30 years and have in the past overlooked messed up jobs, but this is one ridiculous. Just look up the service record. I must say that the employees are always been courteous. I would like to be refunded our money back and have the balance cleared. We have been disturbed over this matter for quite some time, but did not want to complain as this is just outside of our comfort zone. There was an incident where Firestone decided that one of our truck was salvage and prepared to have it towed. We just went and got our truck. That truck was operational for years after that. We did not complain!! Chris advised by telephone that both rear tires must be replaced. He said all tread was too worn to be safe, noted pronounced uneven wear, mentioned exposed steel band on one tire he said was leaking, and he specifically said one tire had a "cut" in the sidewall. Authorized replacement, but asked to look at old tires on pickup. First, old tires were lost, then -- when eventually located, and confirmed to be those taken off my car -- found condition was (consistent with my memory of them when dropping off the car) nowhere near as bad as I was told on the phone. Measured tread depths; recorded values had conveniently (inaccurately) been shaved down by at least 1/32" on one tire (the more worn of the two), and more than 2/32" off on the other. Was aware of some reduced tread depth, commensurate with tire mileage, and particularly uneven wear, despite lifetime alignment. 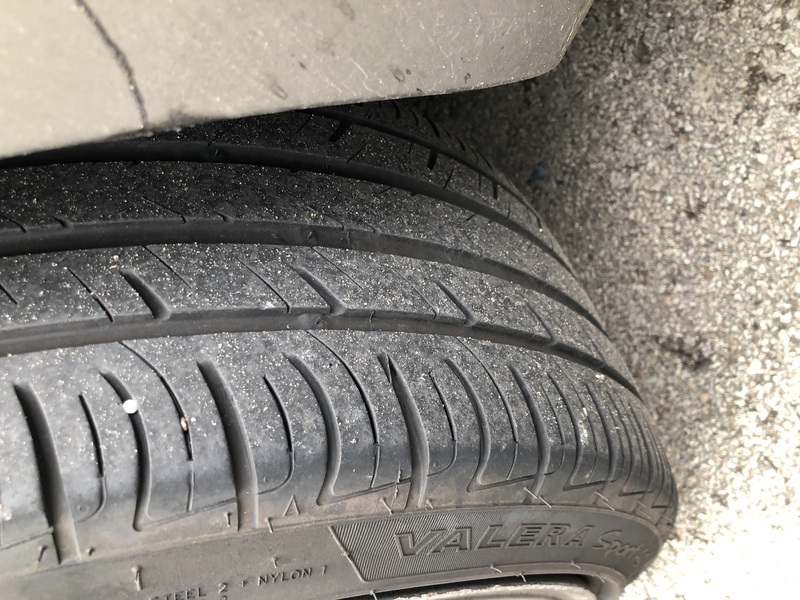 Was not aware of one tire being very worn in a few places, including a ~ tear spot (this is the lower-tread tire), though there was no steel to be seen and the tire has been holding air just fine. Note even 35 psi all around at intake, last adjusted over a month ago. Precautionary tire replacement is never a bad thing, but money is finite, and I depend on honest assessment of conditions I cannot see myself. The tire with torn tread was junk and absolutely should have been replaced. I am grateful for having this problem identified. The other tire was in relatively good condition, albeit inner-corner-worn, with enough tread for at least another 10~20,000 miles. That tire was only minimally more worn than my spare, which is many years older; it probably should have been exchanged with the spare, but too many other issues were muddying the water to make good use of it in this way (unclear exactly how to compare an older spare with a little more tread, to a much younger tire with a bit more corner wear; for spare tire use, I would think tire age is a bigger factor). No cuts of any kind were visible anywhere on either tire. Chris had left for the day, and has not responded to my request for a telephone call (now 24 hours later). I resent inaccurate reporting of tire condition to sell me a tire I did not need. I understand replacement in pairs is preferred, but I would rather have spent that $200+ elsewhere right now, returning later for a new tire. While I have been a customer -- of this particular store -- for 29 years in August, across multiple vehicles, this was my first experience with Chris. Advisor report accuracy has always been variable, and I have to learn for each person how much weight to give their words, but this was new territory with a new person. Chris has lost my respect, with considerable blow-back on the rest of the store. I would have assumed Chris' "cut" was just the visibly torn tire section (of tread), except I had explicitly clarified in advance "on the sidewall ? ", to which he said "Yes". The tire was not leaking. Tread depth shading is simply sleazy. This location is convenient to my work (Caltech), so I will probably remain a customer despite my own better judgement, but I will actively be looking elsewhere when possible. Most of my experience with this store has been good. I ignore a lot of occasional minor distortions of truth, while staff try to drum up work, but this was a new low -- there was no cut or exposed metal in this tire, and knowingly shading down the tread depth is quite unjustifiable. I will begin posting online reviews noting these issues. I hope you will straighten out your staff on what used to be company values of honesty and fairness.